An amuse-bouche (/əˌmjuːzˈbuːʃ/; French: [aˌmyzˈbuʃ]) or amuse-gueule (UK: /əˌmjuːzˈɡɜːl/, US: /-ˈɡʌl/; French: [aˌmyzˈɡœl]) is a single, bite-sized hors d'œuvre. Amuse-bouches are different from appetizers in that they are not ordered from a menu by patrons but are served for free and according to the chef's selection alone. These, often accompanied by a complementary wine, are served both to prepare the guest for the meal and to offer a glimpse of the chef's style. 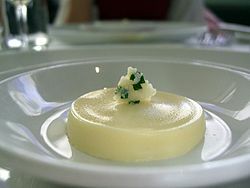 The amuse-bouche emerged as an identifiable course during the nouvelle cuisine movement, which emphasized smaller, more intensely flavoured courses. It differs from other hors d'œuvres in that it is small, usually just one or two bites, and preselected by the chef and offered free of charge to all present at the table. The function of the amuse-bouche could be played by rather simple offerings, such as a plate of olives or a crock of tapenade. It often becomes a showcase, however, of the artistry and showmanship of the chef, intensified by the competition among restaurants. According to Jean-Georges Vongerichten, a popular New York celebrity chef with restaurants around the world, "The amuse-bouche is the best way for a great chef to express his or her big ideas in small bites". At some point, the amuse-bouche transformed from an unexpected bonus to a de rigueur offering at Michelin Guide-starred restaurants and those aspiring to that category (as recently as 1999, The New York Times provided a parenthetical explanation of the course). This in turn created a set of logistical challenges for restaurants: amuse-bouche must be prepared in sufficient quantities to serve all guests, usually just after the order is taken or between main courses. This often requires a separate cooking station devoted solely to producing the course quickly as well as a large and varied collection of specialized china for serving the amuse. Interesting plates, demitasse cups, and large Asian-style soup spoons are popular choices. 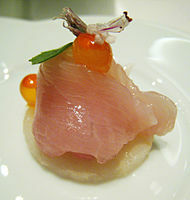 In addition, the kitchen must try to accommodate guests that have an aversion or allergy to ingredients in the amuse. ^ Burgel, Patrick (2005). Le petit dictionnaire des pluriels: 5000 mots. Chatou: Éditions Carnot. p. 35. ISBN 2-84855-114-3. ^ "Centre National de Ressources Textuelles et Lexicales (CNRTL)". Retrieved 2012-06-19. ^ Dictionnaire Le Petit Robert. Éditions Le Robert. 2011. ISBN 978-2849028988. ^ Tramonto, Rick; Goodbody, Mary (2002). Amuse-Bouche: Little Bites That Delight Before the Meal Begins. New York: Random House. ISBN 0-375-50760-4. OCLC 49225896. ^ Friedrich, Jacqueline (1999-01-24). "Choice Tables; Hard by the Chateau, Royal Eating". The New York Times. ^ Bittman, Mark (2001-02-11). "Choice Tables; There's No Free Lunch in London, But Prix Fixe Eases the Sting". The New York Times. This page was last edited on 10 January 2019, at 20:53 (UTC).